Over the summer, Nancy undertook an intrepid kayak trip along the Desmond Family Canoe Trail from Liverpool to Leeds. Along the way, she stopped to visit printmaker David Armes, who made a beautiful broadside of her ‘Canal Kayak Canal’ concrete poem. In between paddle pit-stops, they found time for this interview. David: I have an academic background in Geography, particularly in how the land, the physical features around us, shape our experiences. How we move around, what constrains us, how we talk about that. In recent years, these features have started to make their presence known in the texts I use in my print work. I’ve always travelled a lot and something Robert Macfarlane said rings especially true: “What do I know only in this place?”. That’s become pretty central: what happens to my understanding in a certain place? And why is that? N: I feel extremely fortunate to be working with you on this broadside because I know you don’t usually collaborate. Could you describe your usual process – your aims and the materials you use to achieve them? 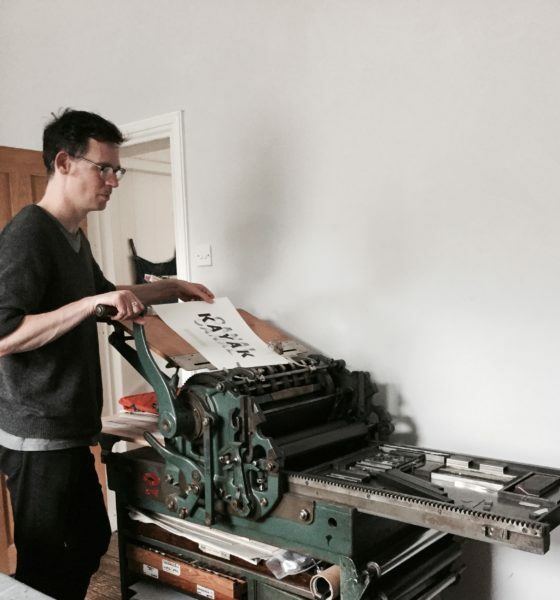 D: Working primarily with letterpress means I work with words and language, fundamentally, represented physically as metal or wood type. I write a lot, but not in a particularly structured or meaning dependent manner. It’s more about generating raw material to work with at the printing press. During designing and printing (which can often be the same stage), the type is as much raw material as ink, paper and other tools. I rarely have a complete piece mapped out in advance. Rather, I have a mental image, sketches, photographs etc. and then allow the process to intervene throughout. Since early 2017 I’ve been working on a series of ‘text landscapes’. The series looks at the idea of responding to a landscape, of writing within and about a place, editing material during the print process, using the language and design to create a figurative rendering of that landscape. My hope is that they draw a viewer in from a distance but can also be read in detail up close. N: I was fascinated to see the extra depth you brought to the concrete poem I presented you with through your handling of ink and type. For example the removal of ink to suggest the water – like a poem, it seems sometimes success lies in what is taken away. Could you tell me a little about your design decisions? they’re a little different on each print but they’re still always in the same position. D: Letterpress is still used as a production process in some situations but, yes, it’s been decades since it was the predominant print method. Plus there’s certainly a newfound appreciation for learning the skill in colleges and universities, particularly among graphic design and visual communication students who want to combine understanding of digital and analogue methodologies and who, indeed, don’t think in binary divisions of digital and analogue to begin with anyway. So there is that question where, once something is no longer what is was, what can it be now? Maybe that frees up thinking in some ways, whether for letterpress, canals, 35mm film or bellcasting. As long as there’s some appreciation of past uses, what happens next doesn’t have to fit within a preconceived framework. 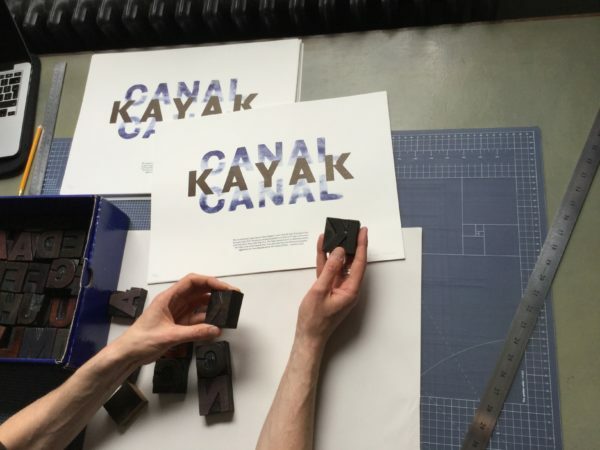 N: What’s next, now the wood type of the Canal broadside is back in the typecase? I plan to create a body of work that continues aesthetically in this vein, using just black and white ink, with repeat overprinting to build up complex shapes and patterns. The Constructure group that I’m one quarter of are also showing recent and new work in upcoming shows over the next few months, in Leeds (October/November 2018), Llandudno (November 2018 / January 2019) and Wrexham (Spring 2019). And I’ve just returned from a residency in Cleveland, Ohio where I created a new iteration of my text landscape series. David’s print of Nancy’s poem is for sale in The Poetry Society Shop.